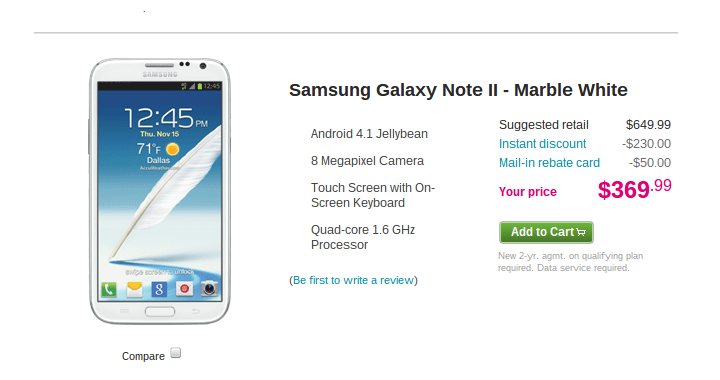 Been holding out for a T-Mobile version of the Samsung Galaxy Note II? We sure hope you’ve been saving your pennies because this thing certainly ain’t cheap. The new handset is now available through T-Mobile’s website at a cool $369.99 after $50 mail-in rebate card and with a two-year service agreement. OUCH. We’d been expecting to see this around the $300 mark for T-Mobile and the other players, and with holiday shopping about to get going, we hope that is still the case. There’s a huge difference in the consumers eye when it comes to numbers that start with a 2 or a 3.